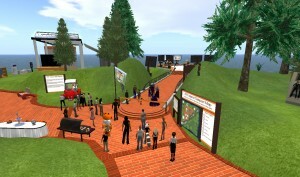 I attended Rochester Institute of Technology’s “official” launch of it’s virtual island in Second Life yesterday. It was a well-attended event: about 40 avatars were at RIT Island when I logged in and RIT staff members said there were a lot of Real Life visitors as well. RIT has been using Second Life as another vehicle for its online education component, with much of the build being created by students. It’s expanded since my first trip there last May and will continue to grow with plenty of 3D models of student projects in areas like economics and mathematics. They not only have excellent resources, but also dedicated staff and enthusiastic students. Expect big things to come out of this project. Will you be in the New York City area this weekend? Make a point of getting yourself to She’s Geeky. The cocktail party begins tonight at 5:30 p.m. and the unconference runs through Sunday at 3:00 p.m.
Here’s the blurb I received from Renee Lloyd. It looks like this will be a great opportunity to connect with other geeky women and share some ideas, do some networking, and have some fun! 4. Build cross generational relationships. Unconferences are a great way to exchange and learn from one another and this is how they work. At the beginning of the day, we create the agenda. Everyone meets in one room and posts topics they would like to present, see or discuss. This creates a rich assortment of agenda items and makes for an exciting day of learning. From there, we go to separate areas or rooms assigned to each topic. The session can be a presentation, inquiry about a question or discussion about an issue or technical field. or. One participant volunteers to record the proceedings. The notes from each session are collected in the newsroom, then a book is compiled with all the notes from the conference and distributed to everyone who attended. 1. Build relationships and even partnerships across disciplines. 2. Learn something new from other geeky women. 3. Find answers to the questions that matter to you. 4. Consider business issues related to the technology industry.